Arsenal defender Shkodran Mustafi has given two reasons he’s been so impressed by the strong start made by summer signing Lucas Torreira at the Emirates Stadium. 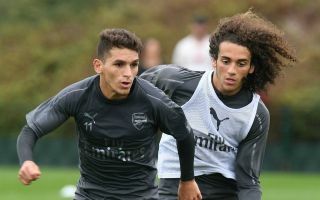 The Uruguay international joined the Gunners from Sampdoria during the summer and has settled quickly into English football, showing both a combative nature in the middle of the park and plenty of quality on the ball to move forward. It’s little wonder Arsenal fans have taken to Torreira so quickly, and Mustafi is also delighted with what he’s added, and admits he’s especially impressed by his form given it’s been a big change for him moving from Serie A to the Premier League. Mustafi himself has moved around a lot in his career so knows the challenges that come with that, so it’s doubly impressive for him that Torreira has been able to make such a meaningful contribution so early. ‘I’m very happy for him (Torreira). He played at one of my ex clubs, Sampdoria, so when he came here, it’s of course not easy, because it’s a different type of football in England,’ the Germany international told Arsenal.com. ‘You have to give credit to him because he’s someone who works hard, who wants to work hard and who shows that on the pitch as well. ‘Against Liverpool he recovered a lot of balls, and that makes it not only easier for the defenders, but for the whole team. As long as you have the ball, you have more opportunities to score. Arsenal fans will generally be sharing this early-season optimism after a fine start made at the club by new manager Unai Emery, who has done well despite taking on the hugely challenging job of replacing club legend Arsene Wenger after he called time on 22 years in north London at the end of last season.